What Are The Benefits of Chronological Resume Template? Apart from looking clean and professional, the chronological CV puts a candidate’s work experience in order. This way, a prospective employer can see the candidate’s professional growth and development within a chosen field. When putting together a resume template, the latest position always comes first in the work experience timeline. Meanwhile, all previous jobs come in descending order. The chronological CV template allows to highlight all of the relevant work skills alongside each position occupied by the candidate. Thus, one can create a highly effective resume demonstrating the candidate’s individuality and result orientation. 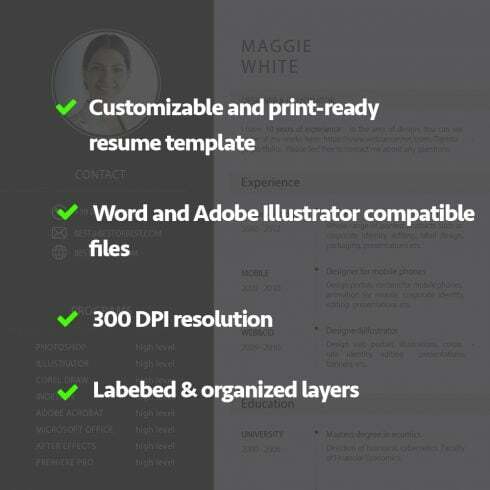 So, which advantages do you get by purchasing a chronological resume template? Please mind, to be able to use and alter the timeline resume template, one has to be a skilled user of Adobe Illustrator and Microsoft Word text editor. 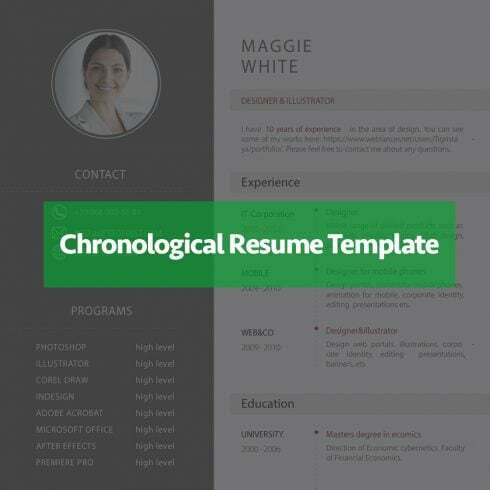 Order a chronological resume template to land the job you’ve been dreaming of!